Dry rot (Eremothecium coryli) is a serious pest of citrus that can affect fruit palatability and citrus rootstock seed production. This pest is not known to occur in Western Australia. Early detection and reporting of dry rot will help protect Western Australian citrus growers. Eremotheium coryli can infect many cultivated citrus species and also numerous other non-citrus crops such as some beans and some nut trees. These hosts are grown commercially and in home gardens. In eastern Australia dry rot has been reported on Australian lime (Citrus australis), lemon (C. limon), mandarin (C. reticulata) and orange (C. sinensis). Dry rot primarly affects the palatability of citrus fruits. Disease is not evident during harvest as there are no external fruit symptoms. Internally, the main symptom is dry and brittle flesh, sometimes this dryness is restricted to some segments of an infected fruit. The inner fruit rind may also develop a brown, gummy discolouration. Seeds are often aborted and appear shrivelled and brownish in colour. Fruit symptoms can vary between varieties. 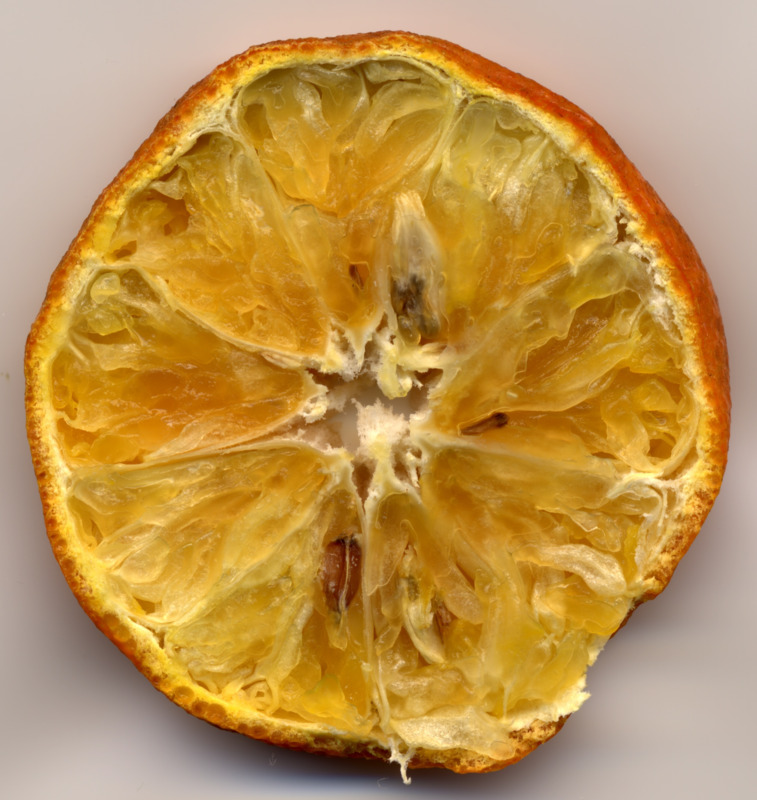 For example, lemons (C. limon) often display severe inner rind browning and seed abortion, however red-fleshed grapefruit (C. paradisi) may not develop any symptoms. Mandarins (C. reticulata) and lemons in Australia are often associated with dry flesh symptoms. The green vegetable bug (Nezara viridula) which occurs in Western Australia, is one of two reported vectors of E. coryli in the eastern states. When vectors of E. coryli are not managed effectively entire crops of lemons, mandarins and citrus rootstock seed can be affected by the disease. Asymptomatic or undetected crop infections may lead to the sale of unpalatable fruit which may lead to poor consumer confidence. Eremothecium coryli (Peglion) Kurtzman 1995 is a prohibited organism for Western Australia. It is important that suspect disease occurrence is reported. Early detection and eradication will help protect Western Australian citrus growers. Please contact the Pest and Disease Information Service to report this pest.